Mamawetan Churchill River Health Region is in the process of designing a new Long Term Care facility for the region. During the week of July 18-22, teams created two potential models using a 3P process. If you would like to learn more about the 3P process and long term care facility design, click here to read our FAQ document. Long Term Care Facility Design Tours are happening! For more information please click here. During the 7 Ways exercise, architects presented 7 different potential facility design outlines. The team narrowed it down to 3 designs by the end of the day. At the 3P event, the 3P team narrowed it down to two designs which will be presented in this virtual tour. 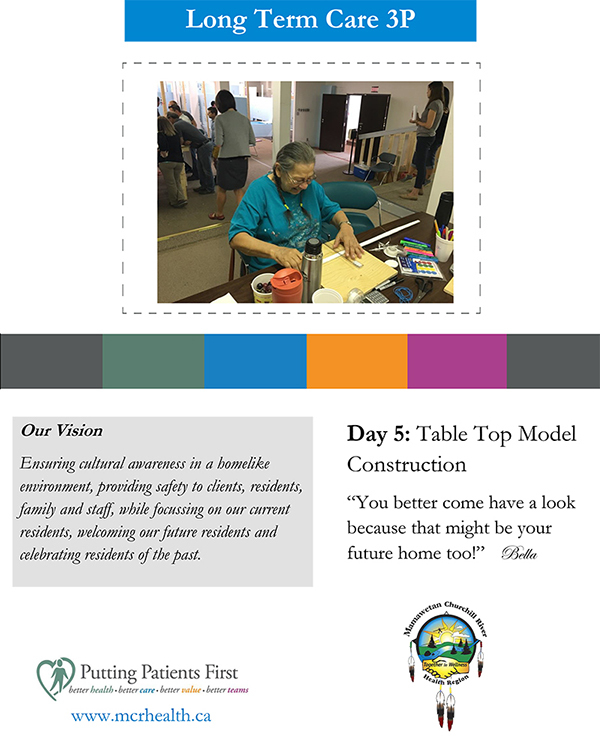 Our photo album menu will direct you to full scale models and 3-D models of the long term care 3P project. Two models were designed by 3P Participants highlighting the design ideas of two teams. The photo album also highlights activities that took place during the 3P event week from July 18-22, 2016.